Ukraine should not buy gas neither from Russia nor the EU, says the former prime minister. 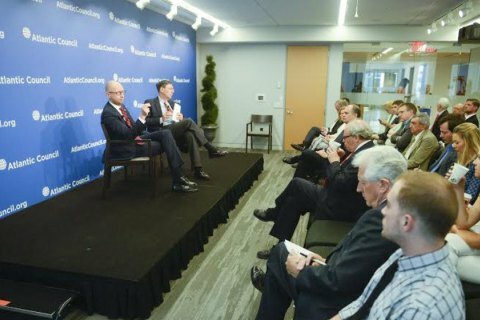 The reform of Energy sector is one of the most important reforms initiated in Ukraine, the leader of People's Front party Arseniy Yatsenyuk said in his speech at the Atlantic Council on 1 July. "I expect that in ten years Ukraine will be completely energy independent. And we will not buy a single cubic meter of natural gas - neither from Russia nor from Europe," stressed Yatsenyuk, who was on visit to the US. He also noted that the management system in the Naftogaz Ukrayiny was completely changed and the deficit Naftogaz has significantly reduced: "We have removed all the intermediary vampires from Naftogaz. Through open tenders, Ukraine signed a number of agreements on direct gas supplies from EU-based companies. The leader of the Popular Front also said that gas consumption was reduced by 20% last year. Yatsenyuk that Ukraine introduced market tariffs for housing and utility services. In parallel, an extensive system of subsidies has been created for the insolvent:"7 million Ukrainian households received direct subsidies from the state. The state covers the utility bill for those who have to pay in excess of 10% of their income." "It was the way to survive last winter," he added. The former prime minister reminded that he signed an agreement last year with US Secretary of Commerce Penny Pritzker a road map for the cooperation between Ukraine and the EU, according to which the government of Ukraine reduced the royalty in the gas sector four-fold in order to attract investors and give a boost to domestic gas extraction. The leader of the Popular Front also stressed that Ukraine has filed a lawsuit with the Stockholm arbitration against the Gazprom for damages caused by unfair gas contracts. "We expect the court to issue the final verdict by the yearend," Yatsenyuk said.